There is more to Holland then Amsterdam. The Dutch Capital gets overloaded with tourists and believe me it is worthwhile to visit cities in the vincinity. Take a chance and jump on a train from Amsterdam to Arnhem. You will be there in an hour. The city is located on the borders of te river Rhine. 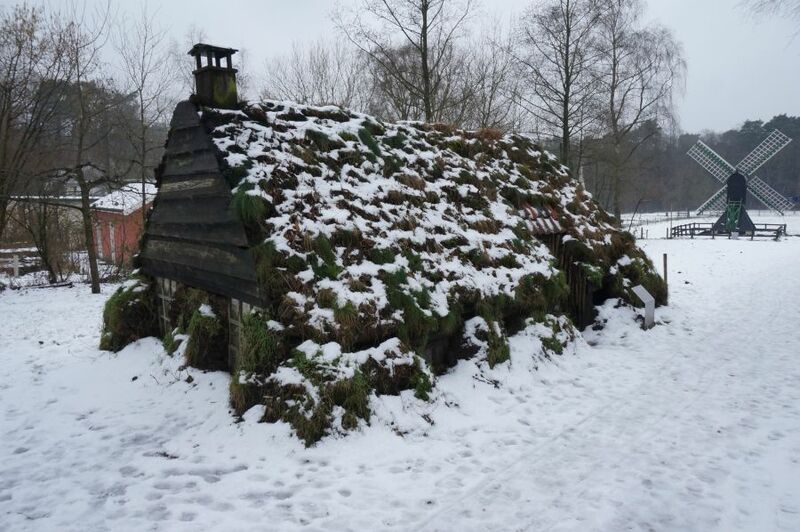 Arnhem offers a magnificent outdoortrip to the National Dutch Open Air Museum. In wintertime the museum is closed on weekdays. But in the weekend it is partially opened. Then you can walk around and follow one of the routes through the museum park. So we did. 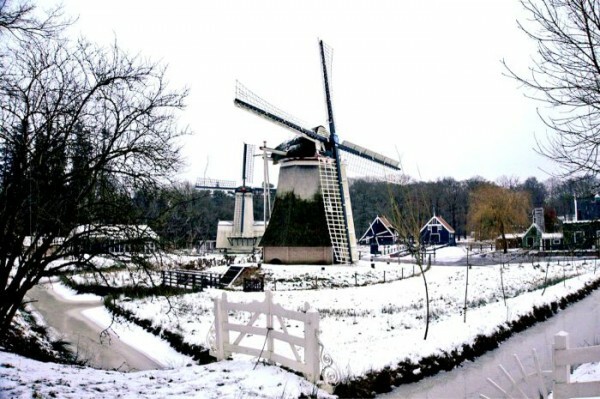 The mills, cafe’s and the restaurant (poffertjeskraam) were closed. The first of april the whole thing opens up again. Located right beside the museum is a wonderfull Zoo. You could buy a combined ticket. In the Open Air Museum you can follow routes in the Museum Park; on foot or by the historic tram and you will encounter windmills, traditional cafes, farmhouses, a herbgarden, fishermen’s cottages and Amsterdam slums. The museum is quite something, really. You could easily spend a day there walking around in this museum which breathes the atmosphere of a vintage Dutch village with an overload of windmills. I was there in wintertime in january. The museum was only open to pedestrians. The windmills, the Brabant cafe, the weavery, the farmhouses, the laundry bleachery; everything was closed. Never mind. Some farm sheds were open and I could feed sheep, horses and goats. Beside annimals the museum offers a great variety of plants. I didn’t find any. The place was covered with snow, you see. The landscape was great! The museum offers an overvieuw of Dutch windmills. A highlight of the Dutch National Cultural Heritage. Among these mills you can visit a horse driven oil mill, a winddriven saw mill, a drainiage mill and a platform mill. A few hundred years ago each village in Holland had its mill(s). At Zaanse Schans near Amsterdam there were hundreds of mills suppplying the city with products or functioning within international trade. The museum also offers an insight in the Dutch Immaterial Heritage. By which I mean customs, dresscodes and traditions. In the summertime there are events. In the Collection Ventre (Spaarstation Dingenliefde) you will be stunned to discover the oddities of Dutch Collecters. Name it, and be sure there will be a Dutchman collecting it. Train and bus: Jump a train to Arnhem from anywhere in the country. From the Central Railway Station in Arnhem you catch Bus 3 to the museumpark. You get off the bus at the stop “Openluchtmuseum”. Bus 91, Line 8 and line 400 also offer connections but go less frequently. Special ticket: There are special traintickets for families. Ask for the Meermanskaart on this ticket a family of max. 6 persons travels for €19.50 a day. By car: Navigate to “Nederlands Openluchtmuseum” or “Hoeferlaan 4, Arnhem”.